Unlike most of the other pages in the webconfig system, this one is designed to be accessed by the end user. To view the information on this page, login with the end user's username (instead of root). 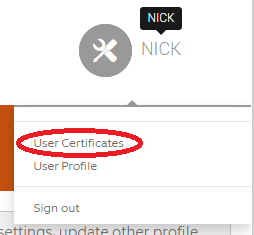 To access the User Certificates, log in is the user then click on the users name on the top right of the screen. A menu will open up with a User Certificates option. button to download the PKCS#12 file. You will be prompted for a password. button to regenerate the certificates. button and then re-downloading them.